Folk Horror Revival: When did you first become aware of Krampus and what in particular about the tradition appealed to you? Al Ridenour: In the mid-1980s, after putting in my undergrad years studying Germanic languages and literature, I ended up going to school in Berlin for a year. Berlin is not in a region with a native Krampus culture but there’s some awareness of the figure. I remember suddenly around Christmas, encountering rows of postcard reproductions of this really lovely Edwardian-era lithograph of a devil’s head with lolling tongue. I bought one without really knowing what it was, and it was up on my wall or fridge for years before I really realized what it was. 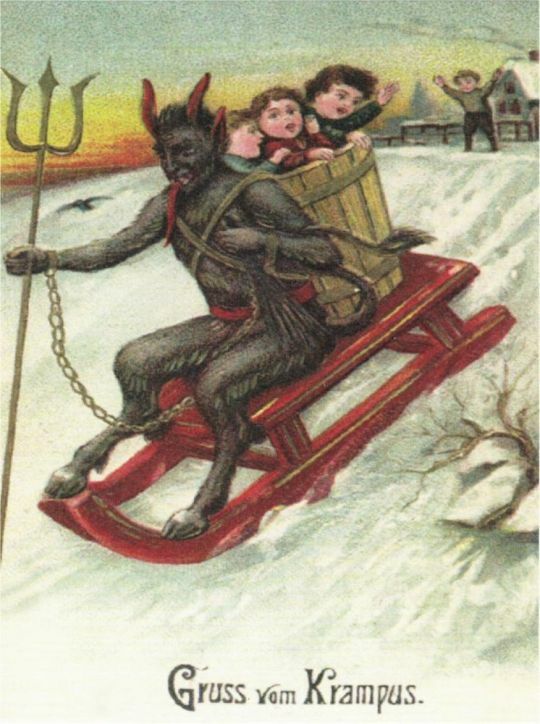 I’d been aware at the time of Knecht Ruprecht, the sort of northern German cousin of the Austro-Bavarian Krampus, but hadn’t really gotten the story on this horned fellow. In any case, my really getting into the tradition happened via a second encounter with these postcards around 2004, when digital reproductions began circulating online. At that time, it all clicked, and I realized this was more than a bit of antique art –- that it was a tradition still being enacted by contemporary Austrians and Germans in stunning costumes. I began pining over YouTube videos showing the live events, and eventually began planning a trip to partake in the fun myself. My casual trip research as to the most traditional locations to visit became the basis for my book. The appeal? Well, they’re monsters! Need I saw more? And as an artist and fabricator myself, the craft of the costumes really appealed to me. There was also such a scarcity at the time of English information on the creature, that it also sparked my more scholastic, puzzle-solving side. And reading up on the topic finally put that relatively useless degree in German to good use! FHR: On the Folk Horror Revival Facebook group, a video post depicting Krampus and some crying kids, kicked off a kerfuffle with some folk even talking about the children developing Post Traumatic Stress Order as adults. Personally as a kid I loved being scared … monsters, ghosts, UFOs, horror films and comics, dinosaurs – I loved all that, the scarier the better. What are your thoughts about the issue? Do you think things like the Krampus are too scary or potentially damaging to kids or do you think the wrapping in cotton wool of children is an overreaction? AR: Well, I couldn’t agree more about a childhood — err, lifelong – passion for frightful s stuff. It’s likely that this proclivity may be a bit stronger in boys, and more still in males who identify as horror fans, but the Krampus is also a creature of fantasy and fairy tale, of the imaginative faculty in general. If you look at our culture’s media output, it’s pretty clear that there’s a universal, thriving market for imaginative extra-mundane tales. 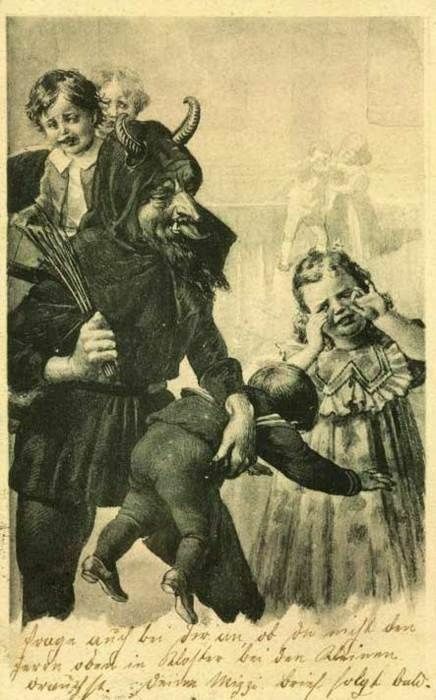 Yes, kids undeniably sometimes cry when they encounter the Krampus, but I feel like I often have to offer a corrective to the view that the whole tradition is primarily about punishing or scaring kids. People outside of Bavaria and Austria tend to miss its playful aspect, not see that it’s really more about play than punishment. While the core myth is that of a punishing figure accompanying St. Nicholas on his annual visits to children’s homes, the practice of enacting this particular story, the private Hausbesuch (“home visit”) is rather uncommon these days. The bulk of the Krampus activity in Europe is a public one, the Krampuslauf or Krampus run, which hardly pretends to be about the figure’s role as punisher. Performers in the Krampus runs typically leave kids alone and instead chase or engage in mock battles young adults of their own age. I devoted the concluding chapter of my book to this “cotton wool” approach to children in regards to Krampus culture. In the era of trivializing “participation awards” in schools, the house-visits particularly give the child an opportunity to really achieve mastery over his own fear but also mastery of some small task – a performance. In the old days, the child would be called upon to recite for St. Nicholas bible versus or the like, but in more secular times, this is often just the performances of some memorized piece of music or poetry. The whole family, aunts, uncles, grandparents, and even great-grandparents are assembled for this moment of truth where the child can shine, where he becomes a star. That such a drama would be staged in the home, with elaborate, expensive costumes, secret preparations and care to ensure success in every detail—all the trouble, work and love devoted to this child-centered production seems very touching to me. If the goal were merely to scare a kid straight, there would be much simpler, brutish ways to do it. FHR: Are there any other aspects of folklore or indeed society and culture that also intrigue you? That interest in rather aggressively engaging the public in guerilla street theater ended up spawning an event called “Santacon,” namely, a drunken mob of costumed Santa Clauses that would take to the streets once a year. I met Chuck Palahniuk, who was a member of the Portland Cacophony lodge at one of these when San Francisco, and Los Angeles members gathered with our comrades for a Santacon in that city. Sadly, I don’t remember much of the meeting as I was more than adequately soused for the occasion, though I do have vague recollections of police in tactical gear showing up to prevent out entrance to a local shopping center. Santacon, like the Burning Man festival, went on to establish itself as an annual event outside of the Cacophony Society, and those of us who’d found it thrilling and challenging in the mid-1990s outgrew it. Missing that chaotic annual revel (though not the heavy drinking),led me to start a Krampus run in Los Angeles. 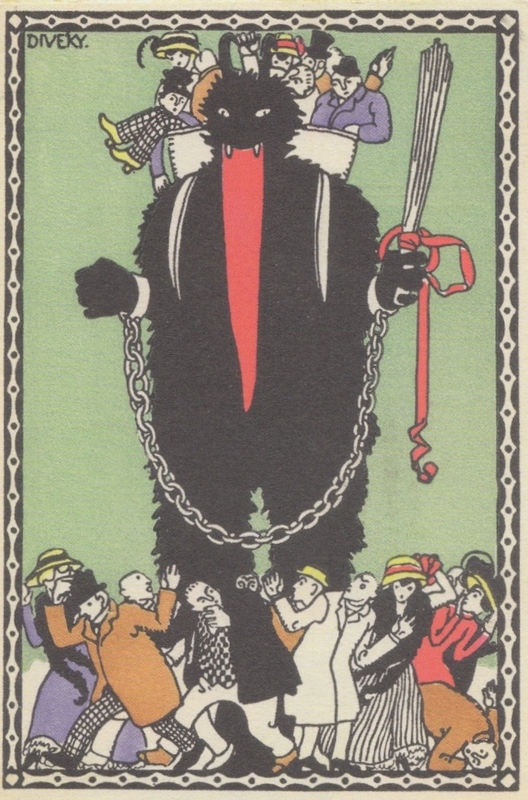 My embracing the traditionalism of the a figure like Krampus is not really that surprising though, given that even in the midst of my subversive Cacophony Society years, I still connected with very traditionalist thinkers like Carl Jung. Early on, I recognized my disposition as more romantic than classical. I’ve always thrived on narratives where rational progressive thought collapses, and only the mythic offers hope. That sort of unexplained, unexplainable liminal experience is something that’s always attracted me. Something like the Krampus tradition or Carnival are traditionalist ways to embrace the subversive, terrifying and absurd. FHR: You travelled quite extensively researching your book; are there any particular place or places, or experiences from these visits that have really stuck in your mind. If so, where and why? AR: I wish I could have done more traveling for the book, but it’s not like I had a travel budget from the publisher. I was able to make it to a handful of Krampus runs in Austria and Bavaria, but the bulk of my research was really done after the fact, following up on contacts I had made and through those visits, engaging others in the Krampus network via email and social networking. Over the years there were a couple visits by my Austrian friends, where I got in more first-person interviews, and our Los Angeles Krampus group was also able to host the first costumed Europeans to run along with us in an American Krampus Run in 2014. As far as memories, one that really struck me, and came to mind answering your question about children’s fears, was an incident I witnessed at a Krampuslauf in Munich. I remember seeing this young, visibly trembling boy near the front of the crowd where the Krampuses were passing. His parents were gently, but insistently nudging him forward toward an encounter. Soon, I noticed, that it wasn’t just me, but others were all sort of breathlessly watching the boy deal with his fears. Eventually he made it to the front of the crowd, and a costumed performer immediately took in the situation, crouched low and extended a claw. By the time the boy stuck out his own hand to meet the monster’s, his parents were patting his back, and all the spectators were beaming — but none more than the kid himself! We could all feel his pride, and it was really touching. And he went on to enjoy the other monsters, getting braver and braver with each encounter. I felt kind of honored, like I’d secretly shared in an important milestone in this kid’s life. FHR: In your work as an artist on projects such as The Art of Bleeding, The Cacophony Society and The Museum of Mental Decay, there is a clear appreciation of the weird and grotesque. Could you tell us a little more about your art? AR: I’ve talked a bit already about the Cacophony Society, but the Museum of Mental Decay was one of our Halloween events repeated over a few years. It was a sort of haunt or haunted house experience subversively interpreted – no readymade horrors from films, but stuff from a more dangerously surreal or dangerously real perspective – the latter, for instance represented by an installation with barely human urban panhandlers stationed in a sort of simulated back alley setting complete with stinking dumpster, all aggressively trying to sell visitors handfuls of human hair. Another year, I constructed an immense walk-in womb installation covered in slippery amniotic goo. I was covered in goo myself and trying to engage visitors with a giant man-sized fetus I’d constructed, encouraging them to hold the slimy thing or even spank it. When they tried to escape, my assistant and I would try to lasso them with the 15-foot umbilical cord attached to the fetus. On and off from 2004-2012, I directed The Art of Bleeding, a rather hard-to-define performance troupe of sorts offering live multi-media shows parodying first-aid and safety education. It was an uncomfortable mix of short original videos and animation I did, repurposed vintage health-and-safety films, puppets, costumed kiddy show characters, and nurses in fetishistic uniform. At the time I owned an ambulance that would also often be featured in the events, including one show about traffic safety staged in a parking lot filled with “crashed” cars (old junked cars I’d bought) with bloodied actors in each telling their accident stories. Over the last years, I’ve been sculpting and selling Krampus masks as well as costumes. My house is always a sort of evolving series of installations too, much of it with an increasingly folk horror vibe, including now a life-size sculpture of a sort of forest witch sculpted entirely from found woodland materials. FHR: I am assuming that horror films and possibly comics may have played a part in your childhood? Could you name a few of your favourite movies, books and artists or art-works for us please? AR: I grew up on horror films, especially the old Universal pictures, which are more nostalgia now, but a couple I still I consider great films, like The Bride of Frankenstein, with all its visionary design, horror, pathos, and wall-to-wall music score. I especially love it for its arch humor. Films that combine the morbid or grotesque and humor will always be near and dear to me– Rosemary’s Baby, The Tenant, The Loved One, The Abominable Dr. Phibes, Evil Dead II and Drag me to Hell, for instance. My infatuation with Universal films encouraged a passion for Lon Chaney’s films, and silent films in general. I love how they seem to emanate another, less substantial world. Guy Maddin’s art films are both wryly funny and evoke this silent world nicely. His recent Forbidden Room is a truly phantasmagoric wonder! I’m undeniably something of a Germanophile, and it’s possible that the German influence on those Universal pictures was part of it. that trickled into those Universal pictures. Of all the silent German horror classics, Nosferatu was most formative. The original, but also Herzog’s remake, are lifelong favorites. If you’ve not seen it, Herzog’s Heart of Glass is also a hauntingly dreamlike period piece, in which the actors all performed under hypnosis. I also love Scandinavian work like (Häxen, Caligari, The Virgin Spring, The Juniper Tree, The Kingdom) and Eastern European/Russian films like Valerie and her Week of Wonders, Sweet Movie, W.R.: Mysteries of the Organism, and Viy (1967). I worked in the film industry for ten years as an animator partly inspired by Jan Svankmajer’s stop-motion, and that of the Brothers Quay who emulate his style. Peter Greenaway’s films seem to have something of the same painterly emphasis on formal compositions as the Quay’s, and he has that dry wit balancing all that sumptuous imagery. My taste in art has become a bit more curmudgeonly thanks to Greenaway, and I now feel a strong affinity for the northern Baroque he celebrates, particularly Flemish vanitas paintings, allegorical scenes, and of course Bosch and Bruegel. In my early incarnation with the Cacophony Society, I was more influenced by modern, transgressive art, particularly performance art, but not so much today. I am not a big reader of fiction, though I have a strange and vociferous appetite for nonfiction about literary movements and authors, naturally the Gothic and Weird Fiction in particular. Flannery O’Connor is one exception, and I’ve read and re-read everything she’s written multiple times. FHR: What is next on the agenda? Are there any other books in the pipeline? AR: Yes, absolutely! And very much within the FH wheelhouse. I have not yet signed a contract, so probably should not mention specifics now, but within the year, I should have an announcement about a sort of survey book that I hope will interest the FH community. As a sort of promotional adjunct to the book, and because it’s something I’ve always wanted to do, I’ve also embarked on a podcast in which I discuss topics somewhat related to the upcoming book as well as my The Krampus and the Old Dark Christmas. It’s called “Bone and Sickle”. The core of the show is me sharing my research on a topic — say, Walpurgis Night or cuckoos — in a very discursive talk mingled with a constant stream of sound clips and quoted passages from 19th and early 20th century texts read by my partner Rick Galiher, who plays my butler. The whole is set in a very M.R. Jamesian study full of these old volumes, and there’s a certain uncomfortable tension between my “character” and the butler throughout. Thus far, I think it’s hitting all the marks FH fans would appreciate, though it’s been a lot of serious production work with original music and effects flowing throughout the entirety of the show. I’m very excited about it and the book! A native of Pasadena, California, Al Ridenour holds BA’s in German and English literature, has worked as an author, journalist, animator, and artist, and has been a fixture in the West Coast underground art community since the mid-1990s. 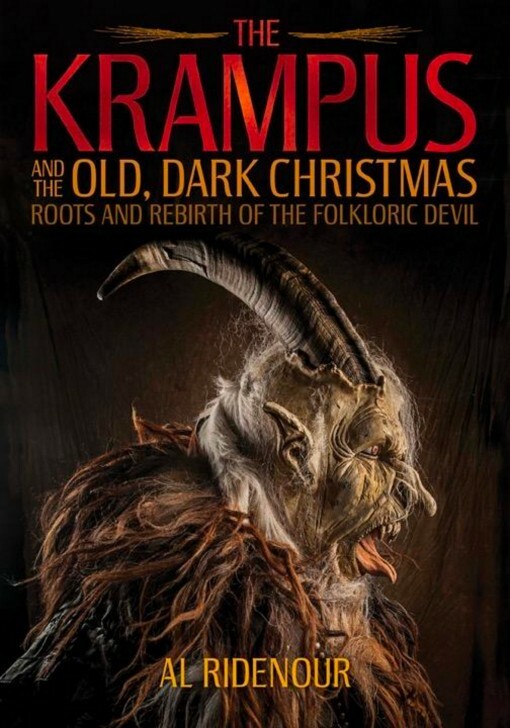 His Krampus research has taken him to the Austrian Alps and Munich, and brought him in contact with cultural anthropologists working in Salzburg and Vienna as well as dozens of members of contemporary European Krampus groups. In 2013, Ridenour co-founded Krampus Los Angeles, an organization that’s made the city ground zero for American Krampusmania. 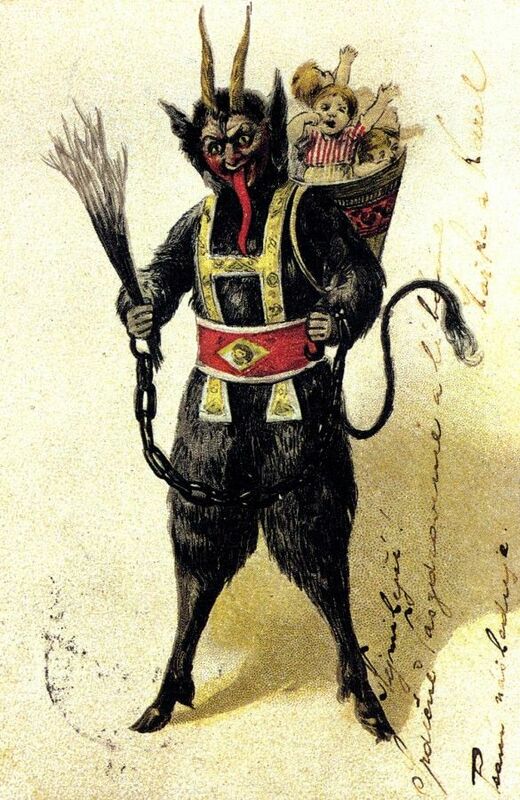 Ridenour has translated and produced the only English-language version of 19th-century Krampus play, written articles, and lectured on the topic at the international Goethe-Institut and elsewhere, and exhibited his Krampus suits at the University of Southern California’s Doheny Museum.